With the help of over one hundred illustrations spanning three centuries, Richard Cohen investigates the role of visual images in European Jewish history. The interaction of Jews with the visual arts takes place, as Cohen says, in a vast gallery of prints, portraits, books, synagogue architecture, ceremonial art, modern Jewish painting and sculpture, political broadsides, monuments, medals, and memorabilia. 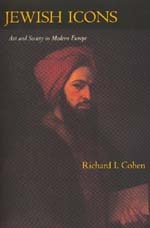 Pointing to recent scholarship that overturns the stereotype of Jews as people of the text, unconcerned with the visual, Cohen shows how the coming of the modern period expanded the relationship of Jews to the visual realm far beyond the religious context. Toward the end of the nineteenth century, the study and collecting of Jewish art became a legitimate and even passionate pursuit, and signaled the entry of Jews into the art world as painters, collectors, and dealers. Richard I. Cohen is Professor of Jewish History at the Hebrew University of Jerusalem. His previous books include Burden of Conscience: French-Jewish Leadership during the Holocaust (1987).